Stevenage boss Dino Maamria says he has no regrets over being red-carded for celebrating their 94th-minute equaliser with the visiting fans at Lincoln. He ran half the length of the pitch after Ilias Chair's strike earned them a draw with the League Two leaders. Premier League bosses Jurgen Klopp and Nuno Espirito Santo have been fined for similar celebrations this term. Asked about the incident, the Tunisian told BBC Three Counties Radio: "That's football - I'd do it again now." 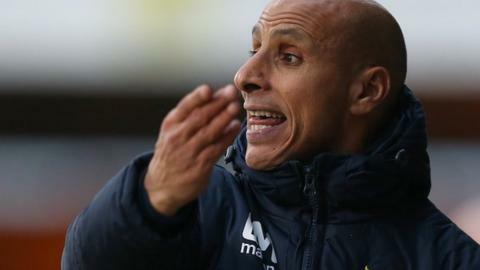 It was the second game running that Maamria had been sent to the stands, having been banished from the touchline at half-time in Stevenage's defeat by Tranmere seven days earlier. He did at least last 94 minutes this time, but was again unhappy with the officiating at Sincil Bank. "Their first goal was offside, the referee missed it - they don't know what they're doing, but they were quick to send me off for celebrating the second goal," he said. "I keep saying we need stronger officials, because I think they're top of the league because they get those decisions. "I'm not trying to take away from the money they spend and the effort they put in, but I think on a level playing field they (Lincoln) would've lost that game today by two or three."